Two decades after the College of New Jersey (now Princeton University) was established in 1746 by the New Light Presbyterians, ministers of the Dutch Reformed Church, seeking autonomy in ecclesiastical affairs in the American colonies, sought to establish a college to train those who wanted to become ministers within the church. Through several years of effort by Rev. Theodorus Jacobus Frelinghuysen (1691–1747) and Rev. 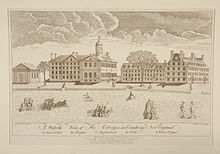 Jacob Rutsen Hardenbergh (1736–1790), later the college’s first president, Queen’s College received its charter on November 10, 1766 from New Jersey’s last Royal Governor, William Franklin (1730–1813), the illegitimate son of Founding Father Benjamin Franklin. The original charter established the college under the corporate name the trustees of Queen’s College, in New-Jersey, named in honor of King George III’s Queen consort, Charlotte of Mecklenburg-Strelitz (1744–1818), and created both the college and the Queen’s College Grammar School, intended to be a preparatory school affiliated and governed by the college. The Grammar School, today the private Rutgers Preparatory School, was a part of the college community until 1959. The location of New Brunswick was chosen over Hackensack because the New Brunswick Dutch had the support of the Anglican population as well, making the royal charter easier to obtain. 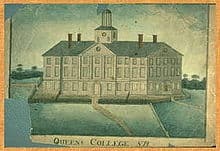 The original purpose of Queen’s College was to “educate the youth in language, liberal, the divinity, and useful arts and sciences” and for the training of future ministers for the Dutch Reformed Church The college admitted its first students in 1771—a single sophomore and a handful of first-year students taught by a lone instructor—and granted its first degree in 1774, to Matthew Leydt. Despite the religious nature of the early college, the first classes were held at a tavern called the Sign of the Red Lion. When the Revolutionary War broke out and taverns were suspected by the British as being hotbeds of rebel activity, the college abandoned the tavern and held classes in private homes.